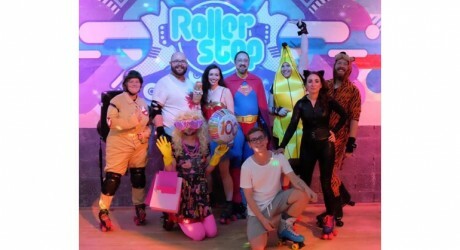 ROLLER skating enthusiasts are teaming up to skate over 2,500 laps to raise awareness of epilepsy. On Sunday 17 September, dozens of people will take on this challenge at Roller Stop, Kinning Park, in Glasgow. Epilepsy Scotland supporter, Tommy Clarke, has arranged the event to increase awareness of the condition. Tommy will be among the skaters trying to smash their target of 2,500 laps, despite using crutches because of a broken foot! The team have set themselves a fundraising target of £2,500 and have raised almost £800 to date through their JustGiving page. Adam Martin, fundraising assistant at Epilepsy Scotland, said: “We were delighted to hear of Tommy’s novel fundraising idea. “Seeing our supporters do something they enjoy and that others can easily get involved in is great, especially when they set themselves a challenge like this one! “I’ll be there on the day to cheer Tommy and the rest of the team on to help them reach their 2,500 laps target! The sponsored skate takes place on Sunday 17 September from 12noon until 5pm. For more details from Epilepsy Scotland please contact: Adam Martin, fundraising assistant, on 0141 427 4911 or email: fundraising@pilepsyscotland.org.uk during office hours Monday to Friday 9am to 5pm. Photo opportunities are welcomed for the event, please contact Adam Martin at Epilepsy Scotland if you intend to come along by calling 0141 427 4911. MEDIA RELEASE issued by Epilepsy Scotland. You too can share your stories (aka press or media releases), on this site. Email here for more information. Check out too twitter.com/allCharitiesPR and twitter.com/allGlasgowPR.